Once a business decides to expand into a new market, it is crucial to have local insight on consumer behavior and trends. Gaining this much-needed cultural knowledge could spell the difference between a success or a failure. As the world’s third-largest economy after the US and China, Japan has an e-commerce industry that was worth roughly USD 96 billion in 2013. This makes their e-commerce industry nearly a fifth of the size of the US e-commerce market. Amidst all of the burgeoning markets in Asia, Japan stands out for numerous reasons: having a stable economy, consumers that have the thirst for specific types of products, and a strong desire for authentic labels. However, there are many challenges abound for businesses that lack experience in Japan, or in Asia as a whole. Businesses may have a difficult time in penetrating the market and consumer culture since Japanese consumers are known to be very selective and require both high quality and excellent customer service. In trying to break into the Japanese market, there is one search engine that you should definitely consider: Yahoo! Japan. At present, Yahoo! Japan continues to control roughly one-third of the search engine market share in Japan. Failing to grasp and use Yahoo! Japan may mean missing out on at least a third of the market opportunities. Established in 1996, Yahoo! Japan started only a year after Yahoo! was established in the United States. It began when Masayoshi Son, the CEO of a multinational telecommunications company, Softbank, invested in the development of Yahoo! in Japan. Through the innovation and development of hardware products, the company expanded with a noteworthy increase in the number of internet users within its early years because of the default browser settings on mobile devices. However, despite having the greatest market share, Yahoo! Japan’s popularity did not last long, as many competitors began to see the opportunities in the Japanese market. Since the arrival of Google Japan in 2000, the search engine industry had a great impact on the internet. With its simple design yet advanced algorithm, Google has become the number one search engine in the world. Instead of being in a straightforward competition with Google’s advanced technology, Yahoo! Japan decided to implement Google algorithms in 2010 on its own search functionality, which enables users to gain more effective organic results. According to their report, Yahoo! Japan has around 70 billion page views per month. In addition, they also report that 75 percent of PC device Internet users in Japan are active users of Yahoo! Japan, and an astounding 90 percent of Japanese who access the web via smartphones are also their active users. Furthermore, 63 percent of their active users on average access the site via smartphone, which is around 57 million unique users in a month. Due to the fact that both Google and Yahoo! 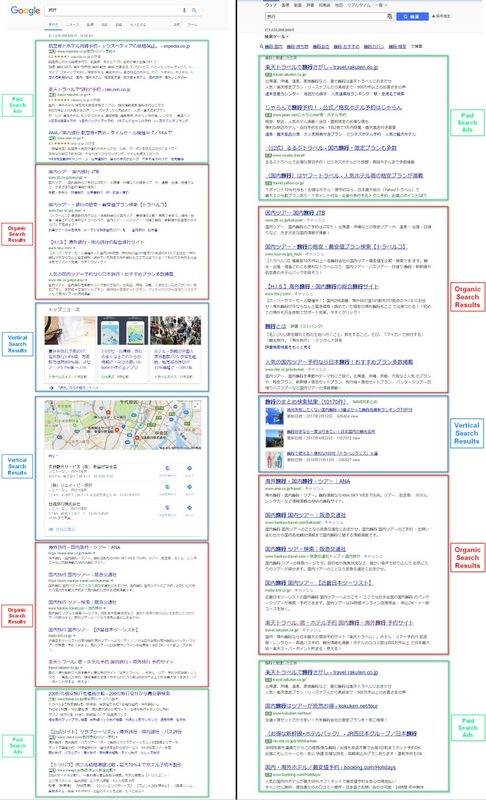 Japan utilize the same algorithms, the listings displayed on the SERP features are mostly alike in the first few pages. For example, in this search result for the term “海外旅行” (Overseas Travels), the top three ranking pages displayed are exactly the same. The application of Google technology on both search engines has directed the two companies into an anti-competitive market that offers users the same user experience. While Google provides the organic search results to Yahoo! Japan, the search results pages may seem a bit different depending on the search queries because Yahoo! Japan often adds their own unique content. That unique content provides more ways for businesses to find various opportunities for visibility in the search results. There are 10 or less universal organic results that are displayed per page on both Google and Yahoo! Japan. This is done in order to improve user experience by making a landing page’s loading speed as fast as possible since according to Kissmetrics, almost 50% of internet users will leave a website if it takes longer than 3 seconds to load. The following screenshot displays the SERP structure and design of both Google and Yahoo! Japan. The section in the red box includes the organic search results that have related or the same rankings and the section in the blue box shows the variances in vertical search results. The basic SERPs are usually shown with a title tag in blue, landing page in green and a meta description in a simple format to provide information about the landing pages. The SERP snippet features of Google and Yahoo! Japan are identical. The search query keyword is in bold to specify the significance of the content on the page. Sitelinks are an essential feature to increase traffic and conversions on a website. It gives users a more effective experience by directing them through a shorter conversion funnel. With the total area that sitelinks cover on the search results, they can also improve brand awareness and click-through rate (CTR). In the case of Yahoo! Japan, it only generates the title of the page for its sitelinks. The knowledge panel displays an outline of information related to a search topic, from basic restaurant information to a summary of a movie. 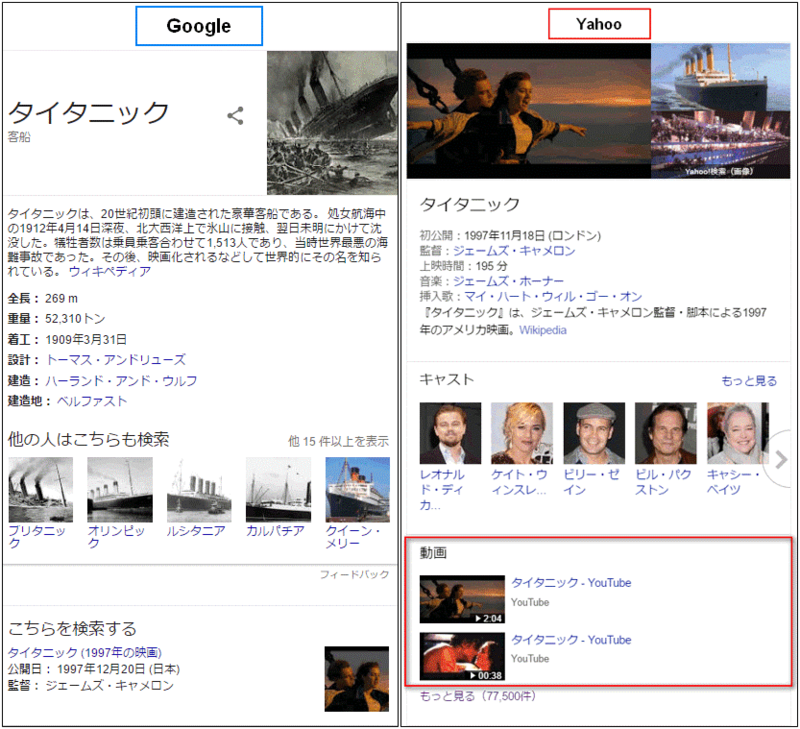 When searching for “Titanic” in Japanese on both platforms, Google indexes facts about the history of the famous ship that sunk in 1909, whereas Yahoo! Japan indexes videos from influential sources like YouTube and Nico Nico Douga for users to have a quick view of related media. Even though Yahoo! Japan’s organic results are powered by Google, marketers need to remember that Google’s ads do not appear on Yahoo! Japan and its content. 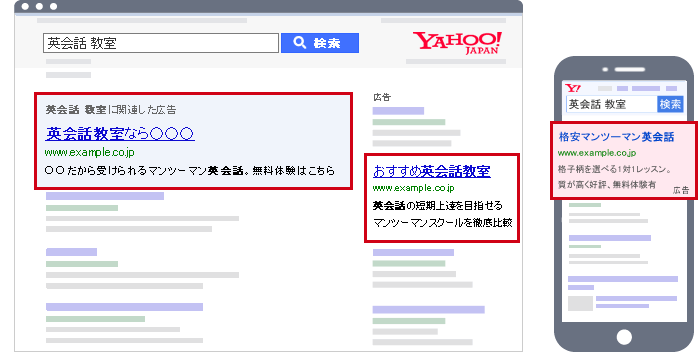 In addition, even by selecting “Japan” as a target country, Yahoo.com ads will not show up on Yahoo! Japan. The reason behind this is that these three companies are distinct and separate entities. Businesses need to set up an account with Yahoo! Japan in order for them to run the campaigns and advertise on their properties. Also called Pay Per Click (PPC) ads, promotional ads trigger the user’s action. This category is divided into two types: Sponsored Search ads and Yahoo! Japan Display Ad Network (YDN). Sponsored Search Ads – these are text-based ads that are displayed to the users who search keywords that are relevant to the ads. Yahoo! Japan Display Ad Network (YDN) – these are image-based ads that are displayed to the users who are interested in a company’s products or services through various targeting functions. Both Sponsored Search ads and YDN ads can be displayed not only on the Yahoo! JAPAN portal site but also on hundreds of their partners’ websites, giving companies more opportunities to reach their target customers. Premium Ads are impression-based ads using graphical or rich media units that remain in the user’s memory. These ads show up throughout the Yahoo! Japan network. Using numerous targeting methods such as area targeting, time targeting, demographic targeting and behavioral targeting, these ads are able to deliver to audiences based on location, on a specific hour or day of the week, based on specific attributes such as gender and age, as well as based on their action history within Yahoo! Japan. There are three types under this category: Rich Media Ads, Display Ads, and Tie-up Ads. Rich Media Ad – these ads are the best option for branding purposes and for raising brand awareness. Its main product is the Brand Panel Expandable Screen that can be initiated by the user through a mouse-over. This ad provides a more powerful message in contrast to traditional ads. Display Ads – there is a full range of display ads available across the Yahoo! Japan network including the Brand Panel Triple Size and the Network Prime Display. The Brand Panel Triple Size ads are displayed on Yahoo! Japan and will grab the user’s attention at scale. On the other hand, Network Prime Display ads are shown across the Yahoo! Japan network and their partner sites. Tie-up Ads – also known as Yahoo! Japan Editorial Coverage, tie-up ads are one of best ways to improve brand awareness for a company’s products or services. With these ads, Yahoo! 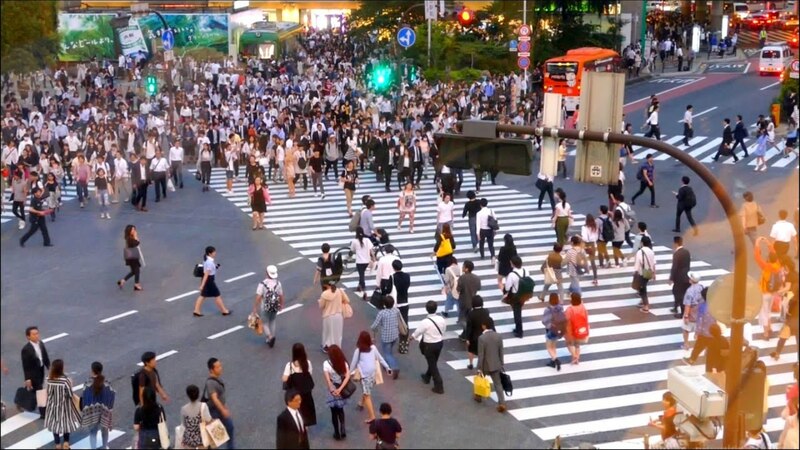 Japan will plan, create, and operate custom tie-up websites for advertisers, using their available big data based on the massive internet user traffic. This type of ad has two main products: Tokubetsu Kikaku and Property Tie-up. In Tokubetsu Kikaku, Yahoo! Japan creates highly effective tie-up pages for companies, enabling them to engage with their target users better. On the other hand, Property Tie-ups involve the creation of the editorial coverage for a company’s products or services on Yahoo! 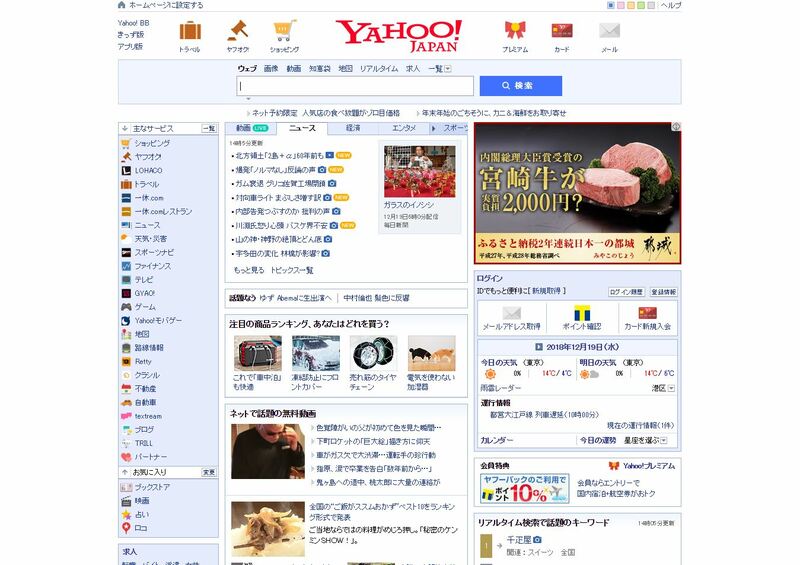 Japan’s websites with specialized themes, such as Yahoo! Japan Movie, Yahoo! Japan Travel, Yahoo! Japan Beauty, Yahoo! Japan Shopping, and so on. Japan has one of the largest economies in the world. However, due to several differences in consumer culture, it can be difficult for businesses to penetrate the Japanese market. One of these differences is in the use of search engines since a third of Japan’s search engine market is controlled by Yahoo! Japan. Ignoring this search engine means missing out on a third of the market opportunities. Thus, it is important to consider Yahoo! Japan as part of your digital marketing campaign in Japan. To get started with your Yahoo! Japan campaign, contact us at Info Cubic Japan today. We are an official Yahoo! Japan agency, and we’ll be more than happy to assist with any questions you may have.